lows. The white line indicates the coast of the Yucatan Peninsula. White dots are sinkholes, called "cenotes." 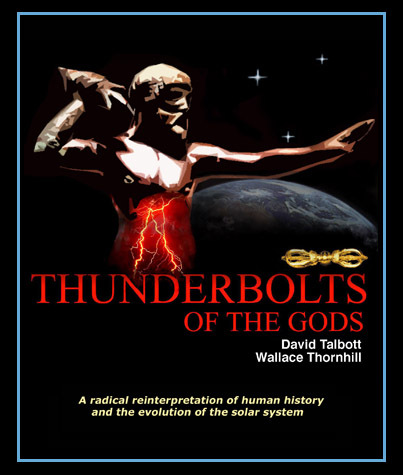 Thunderbolts of the Gods is a 108 page 8-1/2 x 11 full color monograph based on the life work of the two authors--a revolutionary synthesis of comparative mythology and the newly-discovered "Electric Universe". 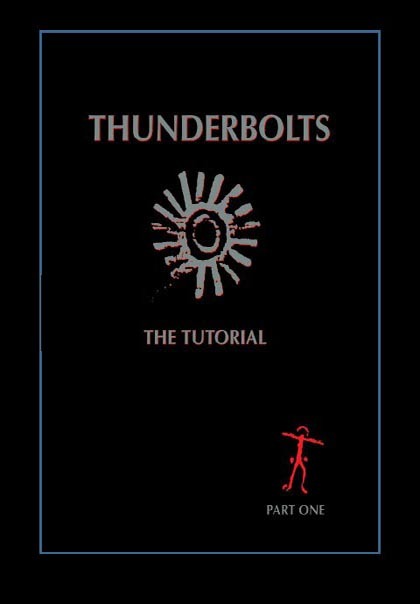 The Monograph includes an hour-long DVD introducing various aspects of the Electric Universe explained by members of the Thunderbolts Group. In the controversy over what killed the dinosaurs, geologists debated volcanism versus impact. Volcanism couldn't explain the facts as well as impact, which won by default. But impact was little better. An electrical explanation, which fits the facts well, was never considered. That an asteroid struck the Earth and killed off the dinosaurs is now generally accepted. The site of the posited strike is the Chicxulub crater, a circular structure up to 300 km across with multiple concentric rings. Much of it lies under the shallow water off the coast of the Yucatan Peninsula in the Gulf of Mexico. This impact would have blasted debris high into the atmosphere and around the globe, and it would have shattered the surrounding and underlying rock with earthquakes of magnitude 10 to 12 on the Richter scale. The debris cloud of this theoretical event supposedly accounts for the layer of iridium-enriched sediment found world-wide as well as for the inclusions of melted spherules and shocked quartz crystals. The spherules and shocked quartz are found as well in formations around the Gulf thought to be debris left by the impact-induced tsunami. The spherules when cut show evidence of being formed by accretion very much like hailstones. It has been hypothesized that they formed in the atmosphere from the condensation of carbonate rocks vaporized by the impact. Above the spherule bed is a thick layer of jumbled rocks of all sizes in a fine matrix. It contains large boulders, as well as numerous cobbles. Dating of the crater, iridium layer, and tsunami debris corresponds with the dating of the dinosaur extinction and other evidence of ecological catastrophe. The dovetailing of this evidence from several disciplines and the theory explaining it has seemed convincing. But a closer look generates skepticism. The distribution of the iridium layer is contrary to the expected drift of a debris cloud. Impacts from various angles have been proposed to try to explain both the crater asymmetry and distribution of ejecta. Cores inside the crater reveal Upper Cretaceous fossils in undisturbed layers —fossils of the creatures that the impact was supposed to have wiped out. Clearly, these layers were laid down after the event. Additionally, the alleged tsunami deposits in Mexico, Guatemala, and Belize show layering that suggests that some were laid down over a long time. These include separate layers with imbedded spherules that had been claimed to be direct ejecta fallout from the Chicxulub impact. Recent investigation linked two such layers to “two events separated by thousands of years during which limestones accumulated and invertebrates burrowed on the ocean floor”. Extinctions always seem to coincide with both continental flood basalts and imagined “meteorite impacts”. But under the prevailing interpretation, the odds of these happening simultaneously are vanishingly small. The electrical origin of the Chicxulub crater and surrounding geology resolves all of the contradictions in the evidence. A stupendous cosmic thunderbolt, occurring in a phase of widespread electric discharging, perhaps lasting millennia, could well have produced features similar to those carved on the surface of Mars, Venus, and the moons of Jupiter and Saturn. The primary crater-producing discharge could have excised the rock inside the crater and left a central peak without shattering the underlying rock. The electrical current, lasting longer than the forces of an impact, would have melted large amounts of material and formed vast clouds of spherules, a key signature of electrical discharge. Indeed, more than 99 percent of the global iridium layer is made up of spherules--droplets that condensed from vaporized rock. Only the remaining 1 percent of the debris consisted of rock pulverized directly into dust. The spherule-producing ability of discharges has been demonstrated in lab experiments. Also, the electromagnetic pinch effect in a discharge channel can generate extremely large pressures, sufficient to shock quartz crystals. The axial acceleration of the discharge will pull debris away from the surface and high into the atmosphere, even into space, and the fallout of unsorted material will be influenced more by electrical and near-space factors than by lower atmospheric circulation. In the impact model, the size of the crater depends only upon the mechanical energy of the impactor, that is, its mass and speed. An electrical crater depends only upon the charge transferred between celestial bodies. Large craters are most likely to occur during the close approach of planet-sized bodies. Such large bodies will also induce massive ground currents, causing the mysterious continental flood basalts at the same time. Electrical craters often appear in connected chains on other bodies in the solar system. 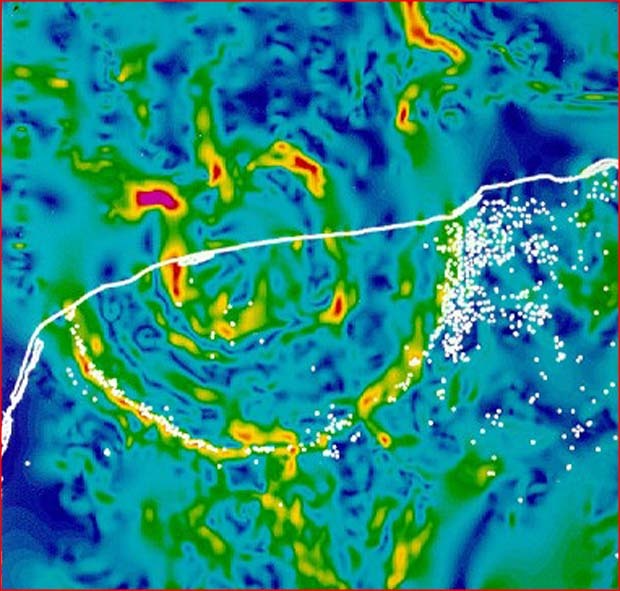 The gravitational anomalies and asymmetry of the Chicxulub basin suggests it may be the centermost of a buried crater chain. When it comes to the question of mass extinctions, it is not clear that an impact like the one claimed to have created the Chicxulub crater is sufficient to cause such a thing. The complexities of the evidence for extinctions do not find simple explanations in either impact or volcanic models. But the one obvious factor that is never mentioned is that the dinosaur megafauna could not survive on the present Earth because they are too heavy to live. It seems to be forgotten that the early dinosaur discoveries forced scientists to conclude that they must have been waders to offset their great weight. Whatever happened to the dinosaurs was far more than a puny asteroid impact could inflict. Nothing was the same on Earth after a global alteration of Earth’s gravity. The triumph of the impact model was not so much because of its adequacy in explaining the evidence as it was a default result: Only impact and volcanic explanations were considered, and the spherules and shocked quartz clearly ruled out volcanism. "We know so little about impacts," says theoretical geophysicist Jay Melosh of the University of Arizona. But an electrical mechanism was never considered because astronomers assure geologists that the planets have always been on their present orbits and in space electrical events never happen.